Bring back playtime, all the time!Dive into a Bubbling Swamp World. Drum on an Outdoor Sound Wall. 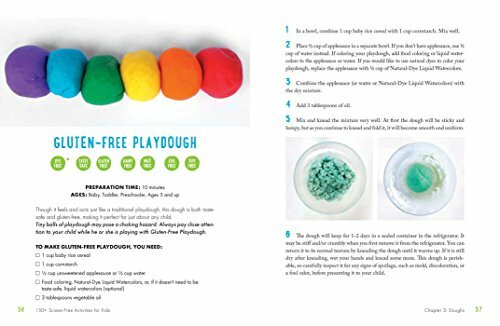 Explore the gooeyness of Glowing Slime.With the one-of-a-kind projects in 150+ Screen-Free Activities for Kids, your family will rediscover the spirit of imaginative play! 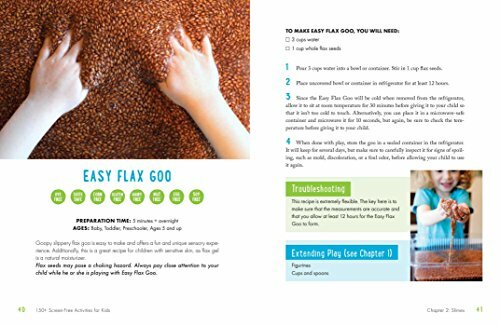 These fun activities help develop your child’s creativity and skills–all without a screen in sight. 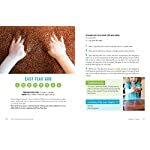 Featuring step-by-step instructions and beautiful photographs, each budget-friendly project will keep your child entertained, engaged, and learning all day long. Best of all, no one will complain about turning off the TV or computer with such entertaining activities as: Natural Dye Fingerpaints Taste-Safe, Gluten-Free Playdough Erupting Volcano Dinosaur World Fizzy Rainbow Slush Taste-Safe Glow Water Complete with dozens of ideas for babies, toddlers, and school-aged children, 150+ Screen-Free Activities for Kids will help your family step away from your devices and step into endless afternoons of playtime fun! –Deborah J. Stewart, TeachPreschool.org and Ready for Kindergarten! Asia Citro has an M.Ed in Science Education and was a classroom science teacher for many years before deciding to stay home full time after the birth of her daughter. She lives near Seattle with her wonderful husband, two awesome children, and two destructive cats. 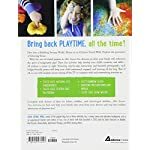 She started writing Fun at Home with Kids in February of 2013 and has since spent many late nights experimenting with new play recipes, sensory materials, and science experiments. 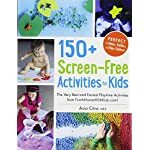 She is the creator of 150+ Screen-Free Activities for Kids, The Curious Kid’s Science Book, A Little Bit of Dirt, and the chapter book series Zoey and Sassafras. Her work has been featured on Apartment Therapy, The Chicago Tribune, Today, Disney Baby, MSN, King 5 TV, and Highlights, among others. To read about her most recent late night discoveries or to see more photos of her adorable kids at play, visit FunAtHomeWithKids.com. 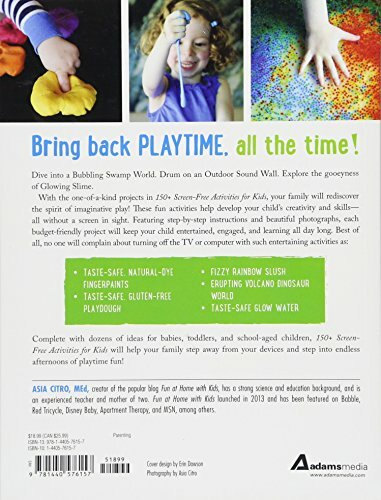 Bring back playtime, at all times!Dive into a Bubbling Swamp World. Drum on an Outdoor Sound Wall. 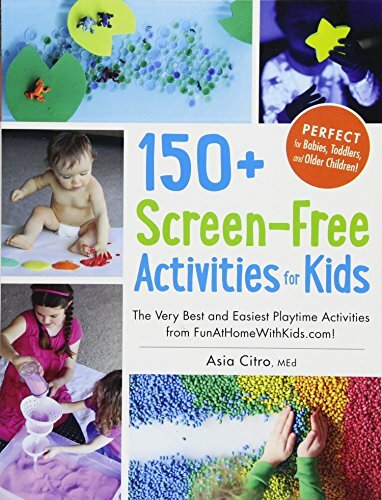 Explore the gooeyness of Glowing Slime.With the one-of-a-kind projects in 150+ Screen-Free Activities for Kids, your family will rediscover the spirit of imaginative play! These fun activities help develop your child’s creativity and skills–all without a screen in sight. 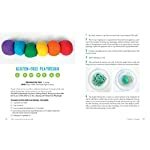 Featuring step by step instructions and beautiful photographs, each budget-friendly project will keep your child entertained, engaged, and learning all day long. Best of all, no one will complain about turning off the TV or computer with such entertaining activities as: Natural Dye Fingerpaints Taste-Secure, Gluten-Free Playdough Erupting Volcano Dinosaur World Fizzy Rainbow Slush Taste-Secure Glow Water Complete with dozens of ideas for babies, toddlers, and school-aged children, 150+ Screen-Free Activities for Kids will help your family step away from your devices and step into endless afternoons of playtime fun!